As discussed in my previous post about social media basics for sales people, a lot of your salespeople might not have embraced social media – yet. The more experienced “old school” sellers and sales executives simply might not have understood the value of social media in business and especially in the field of selling. Sellers and executives who come from various backgrounds might also not be technology-savvy enough to master all the various tools and services involved in using social media effectively. That’s why it is important to get your company’s “web marketing geek” to set up the social media services for all salespeople. A lot of times sellers have very little patience with such things. Remember to also provide training and support. There are several effective ways to keep tabs about what is happening in your key customer’s company. Find out which social media services are used by your customer. You can do this quite easily by searching for the company on google with keywords such as nokia twitter, nokia siemens blog, samsung facebook or cisco youtube. You get the idea. Subscribe to the company blog(s) and news feed. For instance Nokia has a very cool blog aggregator page, where you can follow and subscribe to all official Nokia blogs. Or you might want to go into the specific blogs and subscribe to those separately. You should also subscribe to the company news updates from their web site using the same method (if available). Monitor customer’s updates on Twitter, Facebook, YouTube and other social media networks. There are several tools for this, ask your company web marketing geek. Social media services can help you find the right contacts within a company for your products and services. A lot of times company web sites do not list any employees or only the very top management, which might not be the right persons for you to contact. Getting information about the company’s internal structure can be very difficult. Here’s where social media can speed up your prospecting efforts a great deal. Keywords contained in the user’s online profile. In my experience, the best search results for looking for contacts in a specific company are obtained by using a combination of current company, location, job title/keywords. Search customer company blogs for writers who write about your specific field. The bloggers are usually at least middle management and their names are usually provided as authors often accompanied by a description of their duties within the company. This can provide an excellent entry to the prospect company. Make it a habit to send a LinkedIn connection invitation to customers after every meeting. Your goal is to grow your direct and extended LinkedIn network. 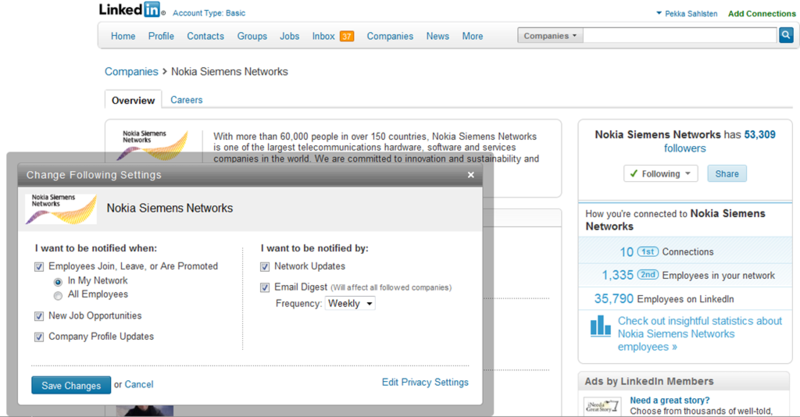 This will allow you to search for people across your contacts’ extended network. Remember that your customer’s LinkedIn connections likely include other people working at the same company and colleagues working in similar roles (as their current one) at other companies (where they previously worked). When you connect to a customer on LinkedIn, you gain visibility to their first-degree network (provided they keep this option enabled, which most people do) and will benefit from their extended network when you conduct searches. Get introduced to “Super Connectors” on LinkedIn. When you connect to a customer on LinkedIn, take the time to browse their direct connections and identify what I refer to as “Super Connectors”. Super Connectors are people who have hundreds of contacts in their first-degree network. By connecting to a customer with so many connections, your extended network will grow much more rapidly than if you connect to a customer with fewer connections. Your goal is to find ways of getting introduced and ultimately connected to these Super Connectors on LinkedIn. Even though a customer Super Connector does not fit your ideal sales prospect profile, it is worth getting introduced to these people because they can greatly help you expand your extended LinkedIn network. Find you customer’s executives on Twitter (you might be surprised positively) and follow them. Their tweets just might give you a heads up on new developments and opportunities within their company. Browse through their followers to find other relevant and interesting people to follow. By following these guidelines your sales team can dramatically expand their reach, gather timely information about trigger events and speed up their prospecting efforts. Social media is not only for teenagers and stay-at-home moms. It’s a world of very effective selling tools – if you just know how and when to use them.